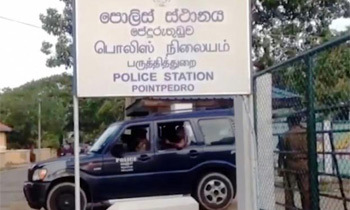 A Sub Inspector and a Police Constable, attached to the Point Pedro Police Station, who were arrested in connection with the shooting which an individual was killed when an illegal sand transporting vehicle was shot at by the Police, were remanded till July 24 by the Pont Pedro Magistrate Court today. The lorry carrying sand was shot at by the Police yesterday at in the Manalkadu area in Point Pedro after it drove through a police checkpoint disregarding police orders to stop. A 25-year-old Yogarasa Dinesh, resident of Nelliadi was killed in the shooting. Police said SI Shiwarasa Sanjeewa and PC Mohammad Mubarak were suspended following the incident. Police said a tense situation had arisen following the incident but police managed to bring the situation under control. Several people are reported to have damaged the goods in the sub inspector’s house. Police said two people were arrested in connection with the attacks. I would say we have to Educate our Police officer as well as Citizen on the value of Human life and moral. Seems the truck might belonging to a politicians as these people indulge in Sand Mafia operations. Instead of shooting they should have saluted the illegal sand transporter. Why didn't the driver stop? How True . Also The the illegal sand transporter should be given guns to protect themselves . No need for salutes. Neither is there a need to shoot to kill. There are much better ways of dealing with such things. Either way. This is open air dumbness. There are laws on how to handle unarmed civilians If shooting is really called for it has to be below the knees. In this case it should have been the tyres. While one side can claim that lorry didn't stop( so they shot to kill instead of shooting the tyres). The otherside is the lorry driver would have refused to "pay" the police, so he threatened and shot, the direction of the bullets can unmask the story. You don't have to salute them, just shoot the tyre not the human. How many ministers should be shot then? Most of them illegally transport sand. Cops have accomplished their duty at the check-point !Truck driver has not obeyed to instructions given by the police officers to stop the vehicle and what else to do other than shooting at the fleeing vehicle.